Check back soon for updates and more!!! New CD is on the way. Looking forward to a great 2013! 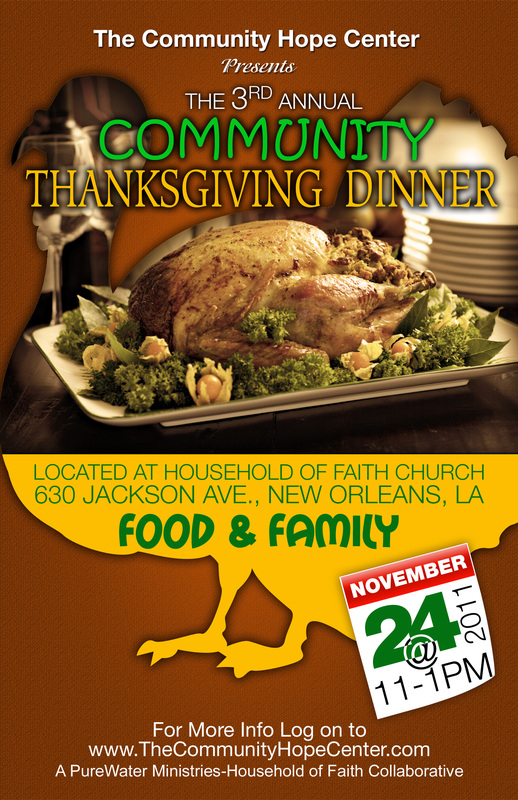 Come share with us at our 3rd Annual Community Thanksgiving Dinner!!! This outreach is an exciting time of fellowship with our community and of sharing with our friends. 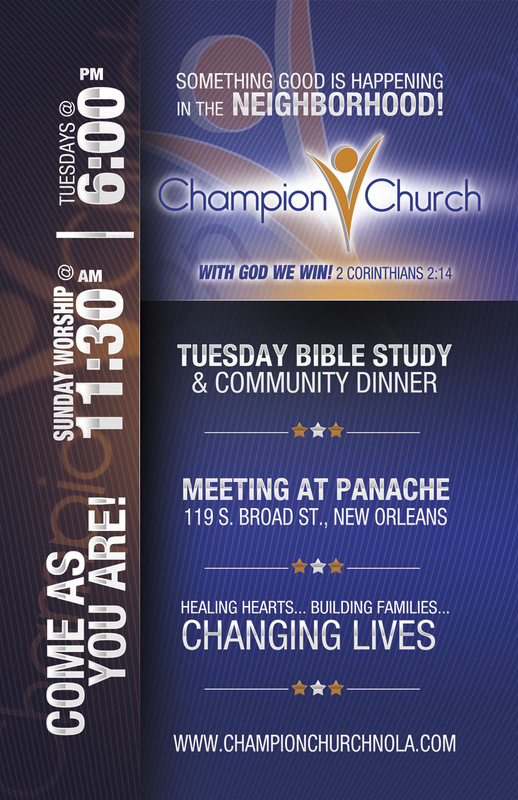 Join us on Thursday, Nov. 24th at 11am-1pm at The Community Hope Center 630 Jackson Ave. in New Orleans, LA. (Located at Household of Faith Church) This event is free and open to the public. Come spread holiday cheer and get to know us better. To donate/volunteer or for more information contact Kimberly Andres at kandres@thecommunityhopecenter.com. Do you want to do more to help those in your neighborhood? Your family? Yor Community? Join Us at the Open House for Our New Missions and Empowerment Center on August 27th at 10am…The Community Hope Center 630 Jackson Ave in New Orleans. For More Information Log on to www.thecommunityhopecenter.com (The Community Hope Center is a PureWater Ministries-Household of Faith Collaborative Outreach) Volunteers NEEDED!! Recently, I had a situation that was hard to face. In fact I had to deal with people who had really done me an injustice. I was bothered so much that I woke up in the middle of the night to have a talk with My Heavenly Father. I asked, “Daddy, how am I supposed to do this?” He whispered back, “If you walk in love, you walk in My anointing but if you step outside love then you will have to do this on your own. “ I was struck in my heart. My success or failure depended solely on my love walk. I already had my bible opened to 1 Cor. 13 when He spoke those words. I had been led to read the chapter. I had no idea of what was coming next. The Lord spoke very clearly to my heart. As I read, the tears began to fall when I was led to insert my name in verses 4-8. I began to think that if I was going to operate in love then I must have to have the character of that love. Some of the characteristics described were patient, kind, enduring. I began to say..”Tara is patient, Tara is kind, Tara is not easily provoked, etc.” The tears started really flowing when I said out of my mouth that “Tara, keeps no record of wrong!” Read it for yourself. Love keeps no record of wrong!!! Therefore, if I operate in love, I operate according to this wonderful scripture. Then the big whammy was dropped on me again. The Lord assured me that “Love Never fails”. If I was going to be successful I was going to have to stay in my love walk. I was going to have to love them the way that He loves me. Thank God for revelation. The challenge was to see them with His eyes and see the situation from His eyes. God wants His children to walk in harmony. We may not agree on every single matter but who cares if you wear your hair in a bun or a bob? Those of us who believe the gospel and who really claim Jesus as Our Lord are still one in Christ!!! I must say that when I finally faced this situation, I was totally & spiritually prepared. God granted me great success because my heart & actions honored His wishes. His anointing was publically present because of the work that was done in private. The Lord corrected my heart and mindset. We all need a little realigning. You may say, “What’s love got to do with it?” I say love had everything to do with it. His love for me and then my love for them and their love for me were all important. In this end time harvest, you will have to walk in love to see Godly results. You will have to believe and believe for your family, your relationships, your vision and your ministry. The love of God cannot fail you. I have seen the hardest hearts crack under the conviction of love (including mine). I have seen families restored and lives literally change because of the love of God which flows through His people. Think about it, do you really love them that hate you or despitefully use you? That’s deep for me. I like calling a spade a spade. When I walk in love, it’s not that what they did is negated, it’s just my response has changed. It’s as if the Lord showed me the big picture. We all lose when we walk outside of the love zone. We all lose when we are in division. Division and bitterness can even lead to health problems. It’s just not worth it to have that kind of strife in our lives. It doesn’t matter what the other party does, choose your own course. If you choose love, you won’t fail. Your heart won’t be clogged with hurt or mixed emotions. Your gifts won’t be choked inside you. You can flow freely when you know that you’ve pleased the Father by giving Him your hurts and disappointments and letting Him love you back to wholeness. The love zone is the failure-proof zone. Love won’t fail because God is love!!! 1 John 4:16 says it best “… he who abides in love, abides in God and God abides in him.” How do I live a failure proof life?….I live in love therefore I live in God!! “You are really convinced that you’ve got all the answers. You’ve really got yourself tricked into believing that you’re 100% right. Well, let me tell you just one thing. Do you consider yourself to be compassionate of other humans? If you’re right, as you say you are, and you believe that, then how can you sleep at night? When you speak with me, you are speaking with someone who you believe is walking directly into eternal damnation, into an endless onslaught of horrendous pain which your ‘loving’ god created, yet you stand by and do nothing. If you believed one bit that thousands every day were falling into an eternal and unchangeable fate, you should be running the streets mad with rage at their blindness. That’s equivalent to standing on a street corner and watching every person that passes you walk blindly directly into the path of a bus and die, yet you stand idly by and do nothing. You’re just twiddling your thumbs, happy in the knowledge that one day that ‘walk’ signal will shine your way across the road. If you live or grew up in a Black community in the United States, you have probably heard of “Watch Night Services,” the gathering of the faithful in church on New Year’s Eve. The service usually begins anywhere from 7 p.m. to 10 p.m. and ends at midnight with the entrance of the New Year. 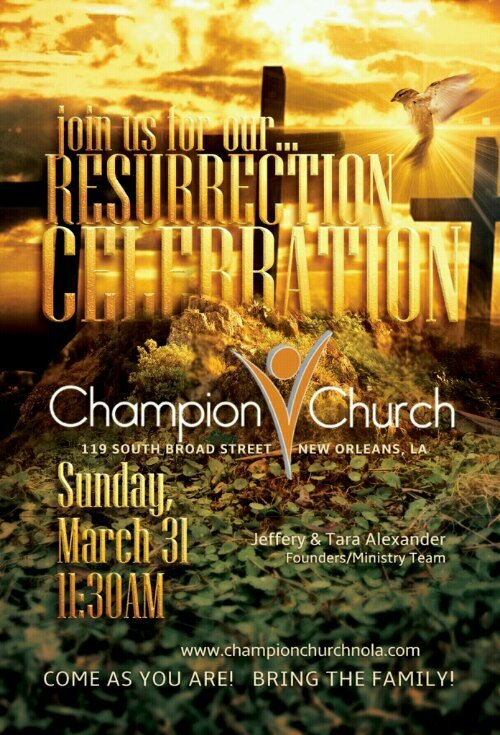 Some folks come to church first, before going to out to celebrate. For others, church is the only New Year’s Eve event. Like many others, I always assumed that Watch Night was a fairly standard Christian religious service — made a bit more Afrocentric because that’s what happens when elements of Christianity become linked with the Black Church. And yes, there is a history of Watch Night in the Methodist tradition. Still, it seemed that most predominately White Christian churches did not include Watch Night services on their calendars, but focused instead on Christmas Eve programs. In fact, there were instances where clergy in Mainline denominations wondered aloud about the propriety of linking religious services with a secular holiday like New Year’s Eve. However, in doing some research, I discovered there are two essential reasons for the importance of New Year’s Eve services in African American congregations. Many of the Watch Night Services in Black communities that we celebrate today can be traced back to gatherings on December 31, 1862, also known as “Freedom’s Eve.” On that night, Americans of African descent came together in churches, gathering places and private homes throughout the nation, anxiously awaiting news that the Emancipation Proclamation had become law. Then, at the stroke of midnight, it was January 1, 1863, and according to Lincoln’s promise, all slaves in the Confederate States were legally free. People remained in churches and other gathering places, eagerly awaiting word that Emancipation had been declared. When the actual news of freedom was received later that day, there were prayers, shouts and songs of joy as people fell to their knees and thanked God. But even before 1962 and the possibility of a Presidential Emancipation, African people had gathered on New Year’s Eve on plantations across the South. That is because many owners of enslaved Africans tallied up their business accounts on the first day of each new year. Human property was sold along with land and furnishings to satisfy debts. Families and friends were separated. Often they never saw each other again in this earthly world. Thus coming together on December 31 might be the last time for enslaved and free Africans to be together with loved ones. Please contact Charyn Sutton at The Onyx Group if you are interested in a presentation on the history of Watch Night at your school or conference. This essay can be reproduced and used with proper attribution to and permission from Charyn D. Sutton. Illustration Citation: Heard and Moseley. Carte de visite. Washington, 1863. Additional information on the history of Watch Night can be found in Emancipation Proclamation by noted African American historian John Hope Franklin and Forever Free by Dorothy Sterling (out of print). Click here to read a sampling of people’s comments. 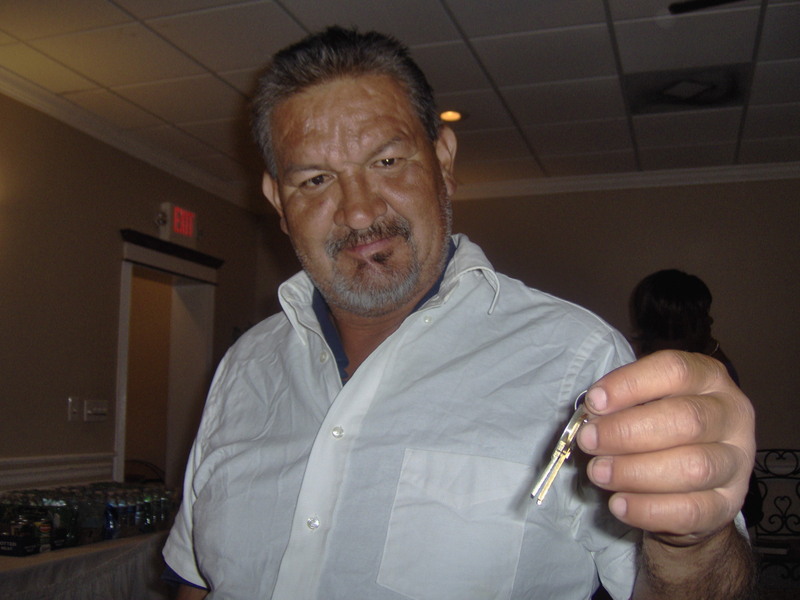 Marty holding up his new house keys!!! Let me skip the intro….Marty got an apartment!!!! He had been living in an abandoned school building for a year. He wanted me to share the good news with all our friends. Marty has been coming to our weekly outreach for more than 6 months now. He has grown so much in the Word!! In fact, he was one of the first people we met in the neighborhood. God has done so much for him this year. Thanks to all our friends who donated housewarming gifts for him. He is so excited and so are we. Praise God!!! !